Pope Francis is greeted by thousands in Washington, DC. Pope Francis is known to be an major opponent of capitalism. On several occasions, he has condemned the American economy. Still, he appeared joyous during his visit to the nation’s capital this past week. 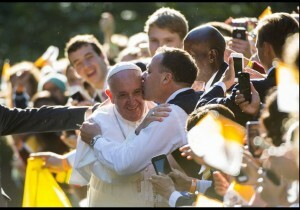 On Wednesday, Pope Francis gave his first major speech in English to a crowd of thousands in front of the White House. 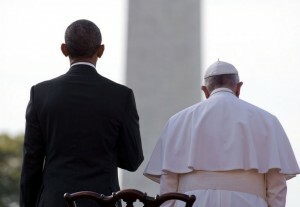 It was the religious leader’s first visit to the United States since his papal inauguration in March of 2013. The papal visit was also the first in seven years. In his speech, Pope Francis graciously thanked President Obama and the American people for welcoming him to the country. He commended Obama’s efforts to reduce pollution and combat climate change; he spoke about Martin Luther King Jr.’s dream and promise to fight for the powerless in society. Pope Francis made remarks about the international community, and the obligation we all hold to fight against injustice. President Obama and Pope Francis face the crowd on the White House’s South Lawn. The Catholic Church is not a business (anymore: see the history of indulgences)– could there be a religious sector? If there is, Pope Francis certainly seems to be exerting his influence beyond it and beyond it and into the public sector and political sphere. And government is absolutely intertwined into the private sector. As evidenced in his recent visit to Washington, Pope Francis is applying stakeholder analysis and ethics to his arguments. He values all people and champions for the protection of individual rights above all else because he identifies all people as relevant, important, and powerful stakeholders in the “business of life.” According to the pope, what’s most important are human rights and respect, regardless of economic performance as long as it is sustainable. Additionally, Pope Francis places ethical reasoning and compassion at the center of his platforms. He is guided by virtue, utilitarianism, rights, and justice above all else. These different ways of thinking and weighing both ethics and stakeholders are precisely why Pope Francis and most businesses are at odds.